This is one of the things I got accomplished over the summer. Like my Oviraptor, I think I'm going to run some test prints and hit a couple with watercolor and see what kind of mess I can make. 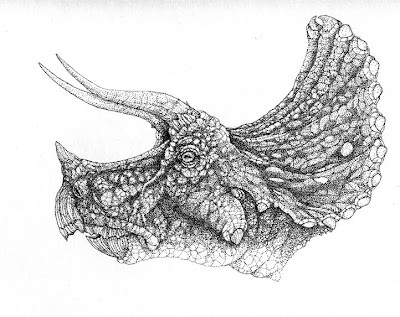 I did all of the comp work for my Dimetrodon pic but haven't gotten around to getting it started because I actually began doing a large Styracosaurus drawing in graphite. And of course I'm really slow on that because school has officially started and I've went doodle crazy here and there. Whoa, this is quite magnificent!! What amazing patience you have! Ditto Caroline! Brian, way to go man, this is truly incredible, once again. Man, all those dots would drive me bananas. This dude has shaped up nicely. Brian, this is awesome! How long has this taken? I think I got through this one pretty quickly for me...8 hours maybe??? Your dino's are always impressive. Nice pen work. This is a fantastic dinosaur. All the detail makes for a really interesting piece I can't stop looking at. I used to be a pointtilism freak!